I parked at the Lake Sebago Boat Launch, and took the unmarked ski trail north. 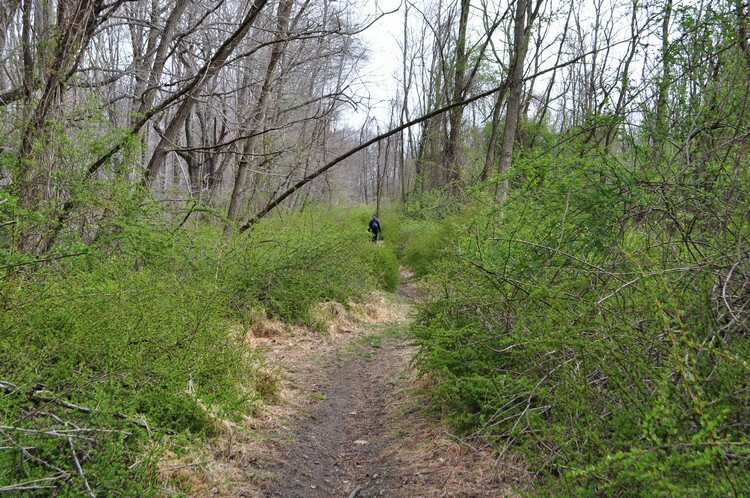 This trail is the old Johnstown Road again, which was eventually replaced with Seven Lakes Drive slightly to the east, though the trail remains on the original road. 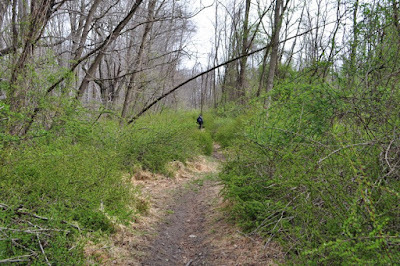 In a short while, the trail crosses the road, and then a bit further meets up with another unmarked trail that climbs Conklin Mountain to the Buck Trail. 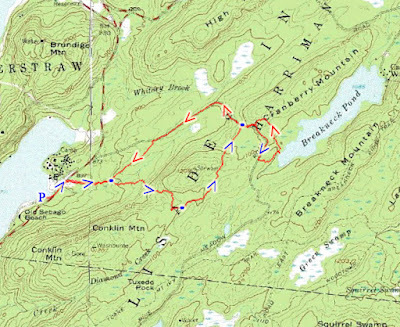 I took that trail up to the Buck Trail, and then took the Buck Trail north to its intersection with the northern spur of the Buck Trail. The northern spur is blazed yellow with a black stripe through it. 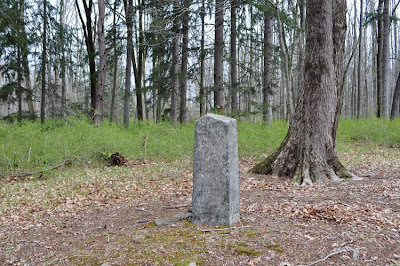 Took the northern spur of the Buck Trail to its terminus at Pine Meadow Road. 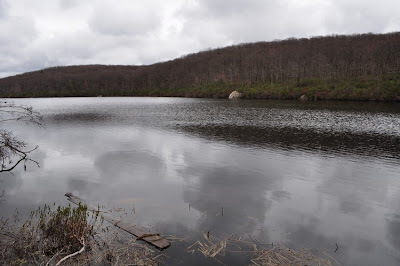 At this point I decided to bushwack from Pine Meadow Road to the Breakneck Pond. This was a big mistake, even though it looks very close from the map. The route to the pond is very dense with thorns and evergreen rhododendrons, and this was extremely difficult. I also was traumatized when I found several ticks upon my jacket and pants once I was done the bushwack part, but luckily I was able to flick them. 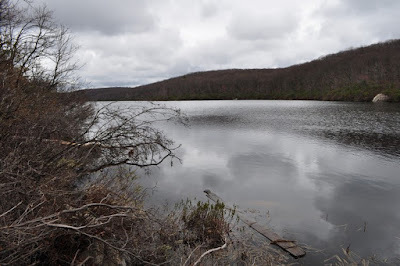 After bushwacking back to the Pine Meadow Road, I went down the mountain, and from there veered off the unmarked ski trail and then back to my car. on the old Johnstown Road. Note the thorn briars with the new green leaves emerging. Intersection of the unmarked trail with the Ski Trail. 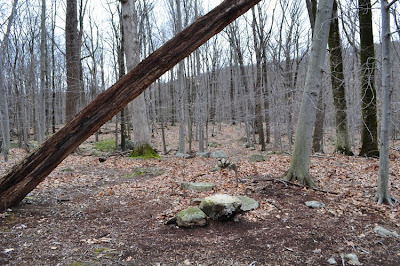 Its easy to miss, but you can find it by looking at the cairns and this fallen tree. 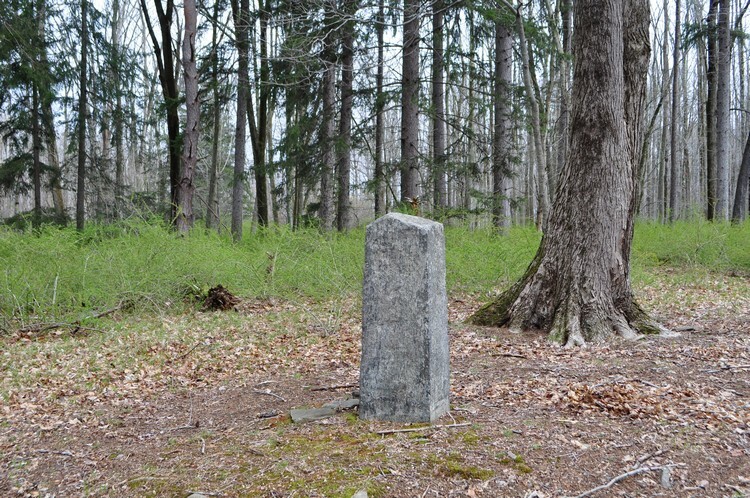 This unmarked trail is well marked with cairns. Conklin Mountain is in the background. 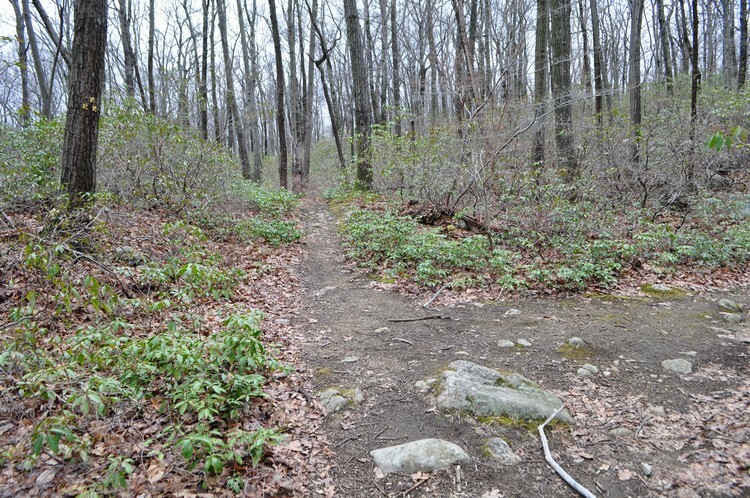 Intersection of the Buck Trail with the northern Buck extension. 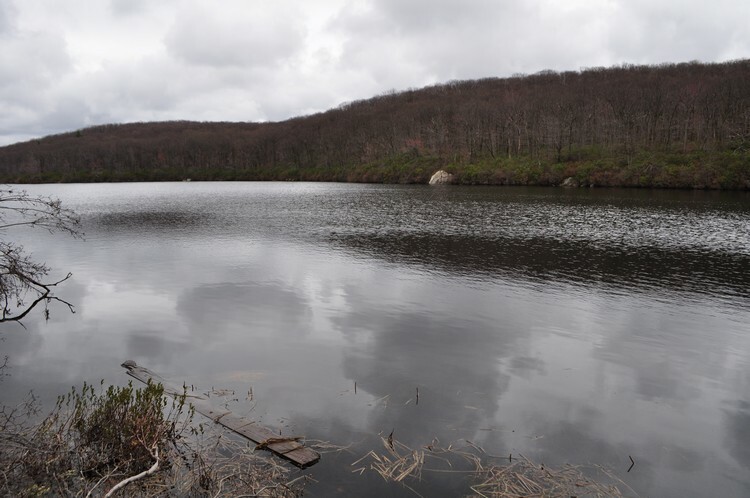 Breakneck Pond, from the southwestern shore. Ditto, with the marsh growth visible. 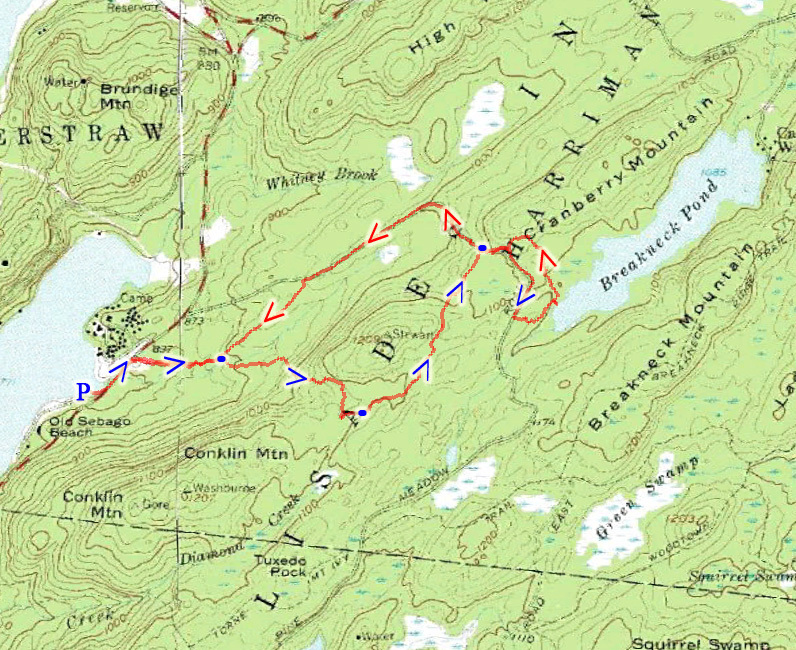 there is a really easy way to get to breakneck pond from the pine meadow road between the branches of the buck trail. the trail is marked after a fashion and fairly easy to follow, it ends up along the shore of breakneck pond and you can follow it all the way to the beach at the end. Thanks! I had actually seen that trail but it wasn't listed on the maps and I didn't know where it goes. Will definitely try it in the future!